This months Birchbox is themed Jet Set. Included in the box are some of the most popular products from places including Australia, France and The USA. Jam packed with sample/travel sized products which will be perfect for taking on your summer breaks away. Now I was a little worried about this months box because I've seen three spoiler posts pop up on My Google reader of some girls I follow not one to obviously like surprises I had a look again lol. Now I don't want this to put off people from signing up because the box I saw was fantastic especially for people who've signed up recently or want to sign up. Three of the products included were ones I'd already received in previous boxes. When I got mine today I was pleasantly surprised and really liked everything I got and there's some really good choices perfect for taking on holiday and mine will be coming with me when I go away next month. So excited I had to post it straight away as I usually do with my BirchBox hence why I'm on on the laptop again despite spending all morning putting ten posts into drafts (yes you heard that right TEN) and I've still got at least four to type up not including this one. I was also surprised because they have yet to make an announcement to say the boxes have all been dispatched and also because I haven't yet got an email either but I'm not bothered because I'm happy as Larry and the weathers helping my mood too. Feel free to enlarge photo by click on it to get a better view. BirchBox says; A lightweight moisturising cream that's loved by the BBx Paris team (and the UK one, they say) This is a decent 15ml size and perfect to fit in my new beauty bag for my break away and should be used after cleansing. It's a gentle approach to anti-aging with 100% natural ingredients that should give tighter and firmer skin. Can't quite pin point the fragrance but it's almost a light floral scent. BirchBox says; A divinely scented, super-rich formula practically made for air travel. This is a small-ish sample but big enough to take for a travel essential for hand moisuturising touch ups. I received this in Cherry Blossom and the tube smells amazing never mind the insides which is just has good. A little goes a long way so this will be perfect for traveling when your luggage needs to be light. BirchBox says; A fragrant hydrating primer fluid that's perfect for your carry-on and holiday. This is again a decent 10ml sample. It's not your typical primer either or at least not like the one I had. It's a creamy moisturising primer which is perfect because I tend to moisturise rather then use a primer which gives me a smooth, even skin tone on my facial area perfect for applying make-up. Word of warning this does take a lot of pumping action (sorry) to get this product out but it does eventually - I hope you have some muscles haha. Really looking forward to using this (This is was available in last months box but I didn't get it and I really want it - Happy days). BirchBox says; A silky powder that fits all complexions, blends seamlessly stays all day. Have never heard of anything like this before the fact it's a staining blush obviously means a little will go along way. This is a tiny sample, but also one of the cutest and the packaging is so pretty. I got the shade Swiss Dot which a coral shade which I prefer to pink blush. BirchBox says; Mineral-rich Dead Sea extracts and mud moisturise for smooth skin. This is a very decent 25ml and I'm really looking forward to using this and seeing the results and seeing if my skin is soft and supple like it claims it will be. It smells really nice too. BirchBox says; Bonafide superfood, packed with health-boosting omega 3, protein and more. I'm always happy to give superfoods packed with lots of nutritional value ago. Not only are they healthy there also filling unlike most unhealthy foods. I'll probably eat this with yogurt. Next month BirchBox are teaming with InStyle this is one exciting collaboration, one that I look forward to seeing. Don't miss it, sign up today here. Subscription is £10.00 a month plus £2.95 postage and you can cancel anytime, there's also packages available which make great presents for loved ones. 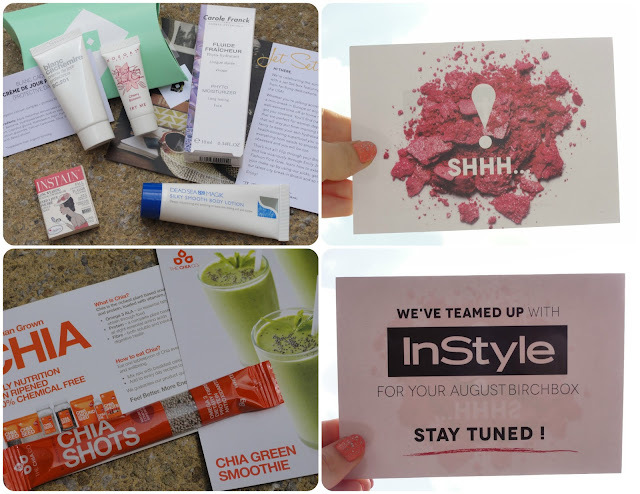 Doing so will give you the chance to collect BirchBox points entitling to you to free treats in there online e-shop. I would love to try the blush stain! xoxo. Lol its good news you got it early, more traffic to your blog. I just joined motel rocks team, I hope you don't mind lol, xoxo.